promotions and special open weekends. 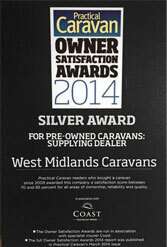 Welcome to West Midland Caravans & Motorhomes Ltd and thank you for visiting our website. We are proud to have been supplying quality used caravans and motorhomes to our customers old and new since 1988, in fact we prefer to call our customers 'friends' as this often becomes the case when you purchase a caravan or motorhome from us. With around 100 Caravans and Motorhomes nearly always in stock, West Midland Caravans and Motorhomes ltd has a wide selection of choice covering all the needs and requirements that you may have when looking to buy or upgrade your vehicle. We are also the stockist of the New Lunar and Venus Caravans. Our sales approach is very knowledgeable, professional and helpful, we believe in helping our customers to make the right choice and purchase rather than the typical hard sales 'pushy' approach that is more usually found. West Midland Caravans and Motorhomes ltd is next door to Jackson's of Old Arley, which is probably the largest caravan and camping superstore in the UK and has a huge awning display as well as all the accessories you will ever need. Come pop in and see us for a coffee or give us a call, we would be more than happy to see you and if required help you with your caravanning and leisure needs.